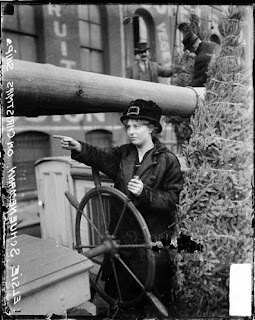 Top: Portrait of Elsie Schuenemann at the wheel of the Christmas Tree Ship, near the Clark Street Bridge on the Chicago River in the Loop community area of Chicago, Illinois. 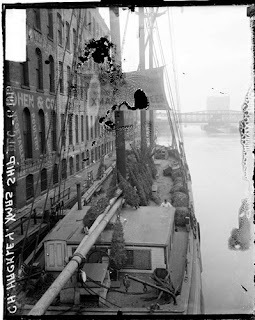 The boat carried Christmas trees to Chicago from Michigan. Her father, Captain H. Schuenemann, died when the Rouse Simmons, a ship carrying Christmas trees, sank in 1912. Middle: Captain H. Schuenemann (center), 1909. I'm debating about whether or not to get a Christmas tree this year. My fiance and I rented out our condo and, along with my mother, purchased a brick two-flat. My possessions are currently scattered across the City and several suburbs, all of it slowly making its way to the new place. For the moment, we're all living like gypsies. The thought of decorating for Christmas is exhausting as we continue to pack and box up our stuff. And which house should we celebrate at? We won't be fully moved until next month. Maybe I'll just get one of those tree-shaped rosemary bushes I saw at Home Depot. They smell terrific and they're portable, too. Anyway, while these images aren't Uptown specific, they do celebrate the old Chicago tradition of the Christmas Tree Ships. 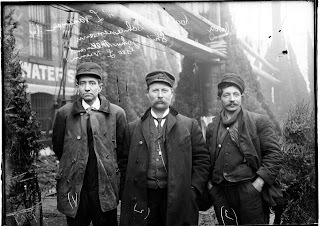 In the late 19th and early 2oth century, Christmas tree-laden ships would arrive each year from Michigan--a much anticipated event. This bit comes from Wikipedia: The Rouse Simmons was a three-masted schooner famous for having disappeared in 1912 with a cargo of Christmas trees bound for Chicago. The ship was sailing on Lake Michigan in a violent storm when it sank off the coast of Two Rivers, Wisconsin, killing all on board. The legacy of the schooner lives on in the area, with frequent ghost sightings and tourist attractions whereby its final route is traced. It was known as "The Christmas Tree Ship" and was one of many schooners to transport Christmas trees across the lake. However, with railroads, highways, and tree farms proving much more economical, the tree-shipping industry was on a steep decline and they had stopped sailing by 1920." Thanks for these! I'd heard about the Christmas ships, but had never seen them. I hope you end up with something seasonal, even if it's not a Christmas tree, for the holidays. I hope your new two-flat isn't out of Uptown. You are surely one of this area's greatest assets. Thanks for your comments on the blog! I was quite excited to find these pictures, too. The new 2-flat is not within Uptown's borders, but close enough that I'll still be here all the time for shopping/eating/entertainment. And, of course, we still have our condo here.